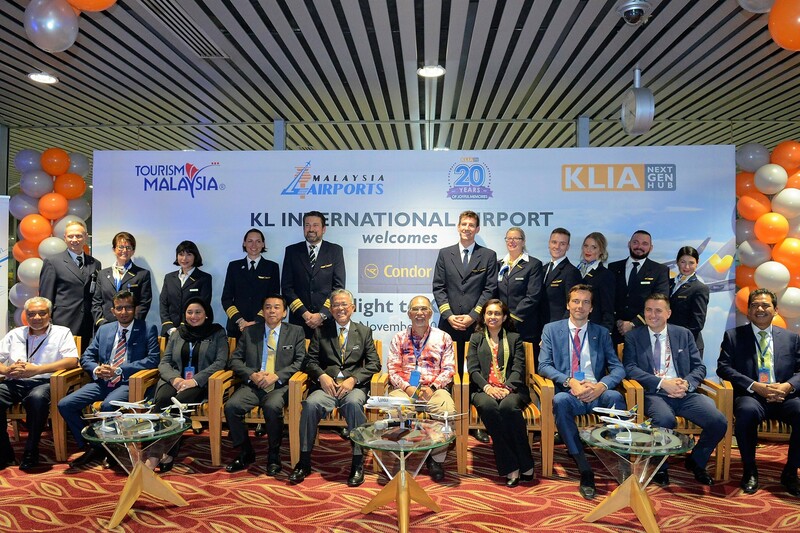 Condor Airlines from Germany is the latest addition to the group of airline operators at KL International Airport (KUL). Its inaugural flight into KUL on the morning of November 2, 2018 was witnessed by the Deputy Minister of Transport, YB Dato’ Kamarudin Jaffar; Deputy Minister of Tourism, Arts & Culture YB Tuan Muhammad Bakhtiar Wan Chik; Deputy Head of Mission and Charge D’ Affairs of German Embassy in Kuala Lumpur, Dr David Krivanek; and Chief Strategy Officer of Malaysia Airports, Azli Mohamed. Condor Airlines, operating via its B767-300 aircraft, flew from Frankfurt International Airport (FRA), Germany to KUL for the first time carrying the ambassador of Malaysia to the Federal Republic of Germany, Sarah Nava Rani Al Bakri Devadason; and the Group Airlines Director of Customer Operations, Managing Director & Accountable Manager of Condor Airlines, Christian Schmitt. Upon touch down, passengers were greeted with a special Malaysian cultural performance, courtesy of Tourism Malaysia. “Condor Airlines is the 58th passenger airline to arrive in KLIA Main Terminal,” said Azli. “I’m also happy to share with you that KLIA has seen a tremendous growth with a 3.2% passenger growth as at September 2018 and is the 12th busiest airport in the world in terms of international passenger movements. Tuan Muhammad Bakhtiar said that the ministry is also happy that Condor Airlines has spread its wings into Malaysia. “With this new development, we can enhance our promotion of Malaysia in Germany and encourage the tour operators there to create Malaysian holiday packages for this market,” he said. Speaking on the new flight route, Schmitt said that Condor Airlines is excited to be the only airline offering a direct flight connection between Malaysia and Germany. “Our flights from Kuala Lumpur to Frankfurt provide Malaysian and Southeast Asian travellers with varied opportunities to discover Europe and Frankfurt as one of the most important economic centres in Europe. Likewise, European travellers have the chance to discover beautiful Kuala Lumpur and Malaysia. By connecting two cities that are of the same importance for their respective regions, we can promote economic and cultural exchange – something we as an airline always particularly encourage,” added Schmitt. Condor Airlines will be operating the KUL-FRA route three times a week on Tuesday, Friday and Sunday whereas the FRA-KUL route will be serviced three times a week as well on Monday, Thursday and Saturday.